Mark Twain wrote The Adventures of Tom Sawyer, The Adventures of Huckleberry Finn, and A Connecticut Yankee in King Arthur's Court, of course, but like any good luminary of 19th-century America, he also put together a few inventions on the side. 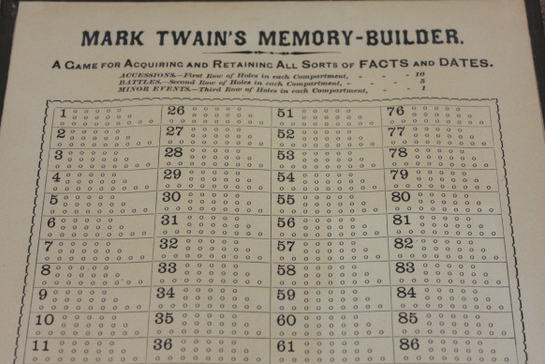 These non-literary achievements of Twain's included an "Improvement in Adjustable and Detachable Straps for Garments" (as the patent calls it) meant to replace suspenders, a "self-pasting" scrapbook", and the "Memory-Builder, a game for acquiring and retaining all sorts of facts and dates." Sixteen years ago when my children were little creatures the governess was trying to hammer some primer histories into their heads. Part of this fun — if you like to call it that — consisted in the memorizing of the accession dates of the thirty-seven personages who had ruled England from the Conqueror down. These little people found it a bitter, hard contract. It was all dates, they all looked alike, and they wouldn't stick. Day after day of the summer vacation dribbled by, and still the kings held the fort; the children couldn't conquer any six of them. This experience gave rise to a couple of different learning methods, of which the Memory-Builder (patented in 1885) would prove the best-known. Though Twain worked out a way to play it on a cribbage board converted into a historical timeline, you can play a technologically much-updated but materially identical version of the game online (with the same cribbage pins and the same strangely intense focus on those royals) at the web site of the University of Oregon's library. Alternatively, you can play an adaptation that deals with the life and times of Twain himself at the University of Virginia's web site. Of course, the internet makes it so that we don’t need to memorize anything today.